So, you’re into Lego and you have a bit of cash to spend, and there’s lots of sets that you really want. The problem is, the sets you want went out of print years ago, and when you look for the sets on Ebay or Amazon they cost ten times what they used to or more. The good news is: it doesn’t really have to cost that much. Lego is Lego is Lego. A 2×4 brick is the same whether it came in the Millennium Falcon or in a starter box. And there are plenty of people who sell parts at nearly retail price (commonly $0.1 per standard part). The bad news is: it’s still gonna cost you. While any set consists mainly of standard pieces, there are always a few that are rare, possibly even exclusive to the set in question. Thus, the only parts in circulation are the ones that came from that set originally (that someone parted out to sell separately) plus whatever extras Lego had in their customer service archives until they ran out. These are going to be crazy expensive, and if you’re not careful it’ll knock the grand total up to the cost of the entire, complete set. Also, a huge set with more than 2000 pieces will cost you at around $200 even if the price per part isn’t that bad, so there are generally no shortcuts to be had. If you want cheap Lego, look for yard sales. So, you want to get the UCS Millennium Falcon, generally considered the greatest Lego set ever made (although the Taj Mahal has it beat in parts count, it’s actually smaller in size), and one of the most expensive ones. Let’s go through the procedure on Bricklink.com. To get started, click the Wanted menu and then Part Set. At this screen, enter the set number (in this case, 10179). 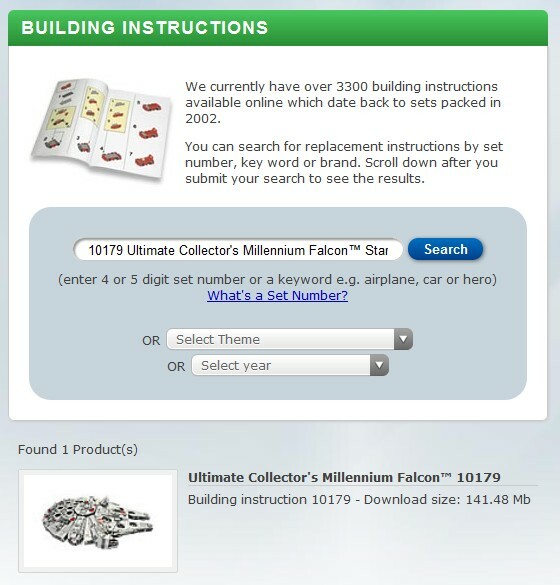 Choose whether you want the minifigures or just the set, the instructions and/or the box. It’s always best to create a new list of parts for a new set so you don’t mix it up with any other items you might be looking for on Bricklink. The condition is up to you. It might be a good idea to start out with only new pieces and then lower your target for the more hard to find pieces. 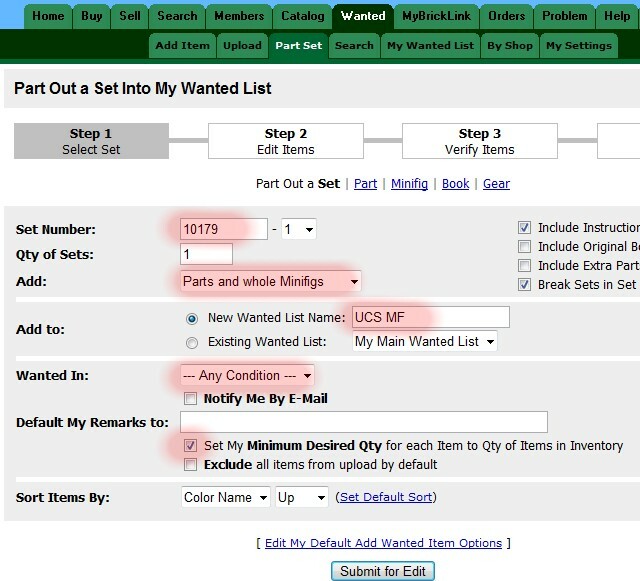 Finally check ”Set my Minimum Desired Qty” so it automatically adds the correct number of each part to your wanted list. The next step is very important and potentially very time consuming. This shows a list of all parts in the set. If you have a decent amount of spare parts (from older sets that you’re not going to rebuild, or previously bought loose parts) you may want to locate them in your collection and set them aside for this build. If you find, say, 500 parts that you already have, that’s $50 you don’t need to spend here. In that case, check the Delete box or adjust the number of parts needed as necessary. Don’t bother with remarks or max price yet. Once you’ve checked all of your collection, you can move on with the next step. Oh, and if it takes a long time, Bricklink might log you out. Use a second window to log back in to not lose progress, before you move on. The third step is just to check your list, so move on. And after that, you have a Wanted List made up out of all the parts needed to build the Millennium Falcon. Click Wanted and then My Wanted List. 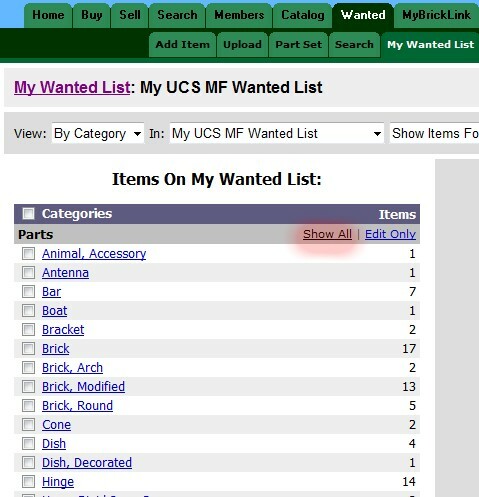 Select your newly created list (if you have more than one) in the top selection and then click ”Show All” on the Parts category. Since there might be other types of items (like instructions or minifigures) in your list you may have to repeat this step with those later. Normally you get the sticker set first in your list and this is where you need to reconsider if you’re up to this task. 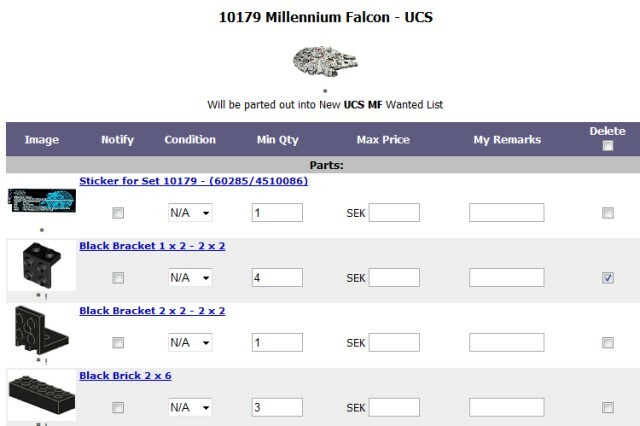 Sticker sets are by definition unique to a set and for any set like the Millennium Falcon, these will be hilariously overpriced. At this point, if you want the 100% real, complete set, you realize that you might as well hunt for the set itself. If you’re prepared to make changes to not kill your wallet, read on. You generally want to get as few orders as possible, but as you can see from the prices, sellers charge very differently for each part. This is where you get a Max Price for each part, and possibly change whether you want a New or Used part. If there are only a few sellers, you might need to settle for Used. If there are tons of sellers with the necessary parts count, you can set a lower Max Price so you’ll only see stores that qualify. Since it’s hard to keep track of each part, I use these to not get too ridiculous prices. Sometimes you get no results at all. It might be that the part is so rare that no single seller has the required amount. In that case you can choose a lower Min Qty than what you really need. In that case, write under My Remarks how many you actually need so you can pick them accordingly once you find them. In the words of E.T. : ”Ouch”. In some cases, you are simply up the reddish brown creek without a 2542. There is a part that’s needed for the construction and it’s way, way, way out of your league. This is usually what makes these sets so expensive to piece together properly. Modular houses often have rare doors or windows. One of the classics from Millennium Falcon is the boat rigging. This is used internally somewhere, and the light bluish grey version only ever came with this set. Another is the 10×10 decorated radar dish which is completely unique to the MF. Pieces like these will send your budget sky-high. If you don’t necessarily need the correct ones, and we already established that you don’t, here’s what you can do. 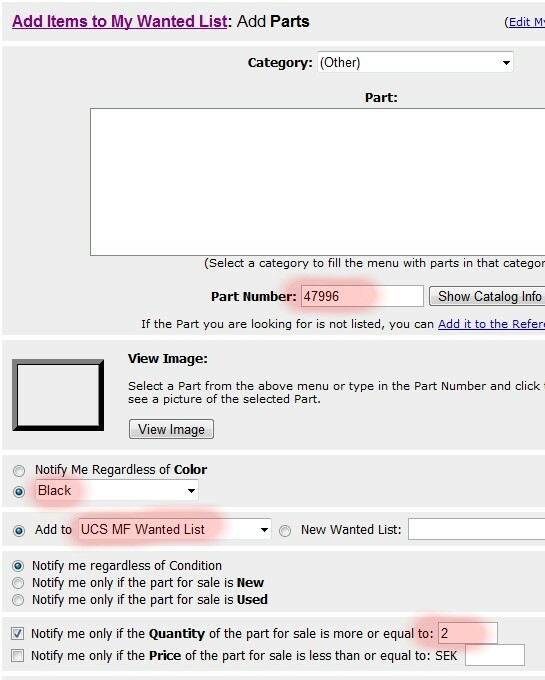 Click the part name in your wanted list and you get to the part info page. On the right you can click to see what sets the part came in originally. If there’s only one, you’re generally in trouble. If there are several, you may want to add those sets to your wanted list. It’s very rare to see an unwanted set with a rare part sell for less than the part itself, but it might give you more options to find sellers from. For example, I wanted the green hair off an Exo-Force figure but few sellers had the hair by itself. By adding the entire figure to my wanted list, I could get it that way. If you’re lucky, you might be able to cross off more parts off your shopping list. - Find another colour for the part. The exact ones used for the set can be much more expensive than any other colour, just because they’re needed for that or more rare in that colour. - Find another similar part. Older parts are sometimes replaced with new variations, usually to be more durable. For purists there might be a difference and in some cases (like the 1x2x3 panels used in Café Corner) there is a visual difference, but you have to weigh this against the difference in price. Usually there’s a ”This part is similar in mold type” notice at the bottom, but sometimes you need to figure this out yourself. Especially windows have changed rather recently, so there might be better new options. - Find another combination of parts. All these alternatives require some knowledge of the set and its construction (tip: check online manuals!) to know what you can get away with, but sometimes a rare part was simply used just because. For example, in Café Corner there’s a reddish brown 2×10 brick that is very rare. But it’s just a piece of the wall and functionally you can just as well use common 2×4:s and 2×6:s there instead. Now you have a list of what you need, so let’s go shopping! My first stop is actually not Bricklink, but Lego’s own Pick-A-Brick service. 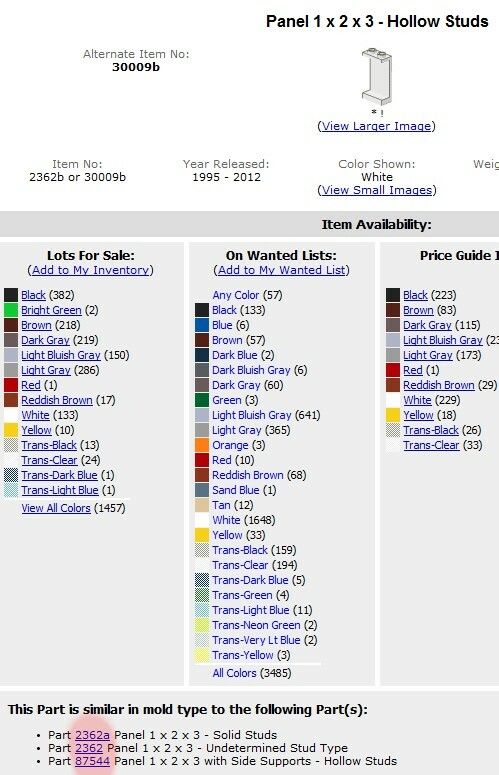 PAB tends to have slightly higher prices in most cases, but they also have a good supply of rare-ish pieces, especially basic pieces in rare colours like dark red, dark blue and medium blue. They also don’t have a minimum order cost, you can avoid shipping if you’re getting a ton of pieces, and you can qualify for whatever free gift they have at the time. You even get VIP points. Cross-checking the wanted list with the PAB inventory, I make orders for every piece that I only need a few of, or anything that isn’t too high above the standard BL price. Remember, it’s useful to make as few orders as possible. The only real problem with Lego PAB is that you need to manually delete anything you buy there from your wanted list. Now, let’s see what Bricklink has to offer. The quickest way is to click Wanted and then By Shop. You get a list of all sellers that have the parts you need. 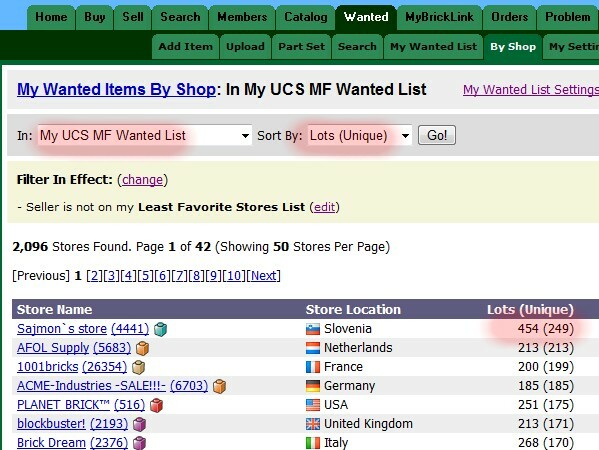 You can change settings for regional selections, to exclude sellers that don’t ship to you and other things, but the main option is to choose only your current wanted list and to sort by Lots (Unique). The second number in the list shows the unique parts that the seller has enough of. Click the seller you want to have a look at. You get a list of all the parts you want. If you have several wanted lists, you can choose to just look at one for now. 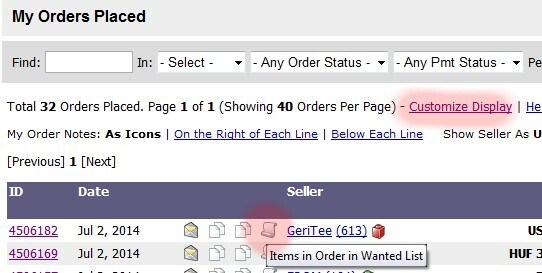 There is a useful option to auto-fill the Add To Cart box with the number of each part you need. HOWEVER, many sellers tend to have several lots of the same part, for no apparent reason. Sajmon’s Store is a good place to find parts but he tends to have several lots, so if you just auto-fill and add all of those to your cart you’re going to end up with multiples. In some cases, there are varying quality of parts, or lower prices if you buy a set amount. Look around for the best prices before you add anything, and make sure to check the seller’s terms like shipping costs, fees and handling times. If you have been simply buying from the sellers with the most parts, you will have ended up with a wanted list with a few rare parts left that noone happened to have. It might be a good idea to do it the other way around: to find one of the sellers who has the rare part, then check whatever else they have and get that too. Otherwise you may find that these last sellers with the rare parts want you to buy more stuff to make a minimum order value. Or, once you get to this step, you can look for whoever doesn’t have a minimum order value. Either way, after making orders of hundreds of parts in one go, you will probably have to make a few specialized orders for a handful of parts. Since these are probably rare, and you need to pay shipping, these tend to add up. You often find that several sellers have different combinations of parts, at different prices, and it can be hard to see which ones you should get. What I do is make an Excel sheet with the parts and the sellers, then enter the cost for each part. That way I can get an overview of what sellers I should buy from to complete everything I need. However, I only do this for the last few pieces, when I’m down to about 2-3 lots per seller. At this point it’s also good to really look for alternatives – maybe you can get one part from this guy and another from this one. Maybe this part is cheaper in old light grey and doesn’t show from the outside. Maybe you can accept a higher price just so you won’t have to make another order. This is where it pays to be patient. Is a part currently expensive? Set a maximum cost and set an e-mail notification and wait around for someone to make a better offer. Are all the parts you need only available in two lots per seller? Wait for someone to have them all available. Et cetera. However, I’m rarely patient. This is why my builds have become more expensive than I expected. This is also why I’ve managed to complete quite a few of them. Rare parts stay rare in most cases, and only get more expensive as time goes by. However, Lego has been known to reuse very attractive pieces in new sets. The rigging I talked about earlier (used in Millennium Falcon and in many pirate sets) was put in production again for the Sea Cow and probably upcoming pirate sets. The dark red roof slopes for Café Corner were even more expensive before they went into production for Pet Shop. The sand green walls of Green Grocer were much more achievable after the Haunted House introduced tons of new wall pieces. And the super-rare dark blue arch used for Market Street and Café Corner was used in the 2013 Winter Market set. As soon as Lego produces a piece again, you can either buy the set in question or order the part as a replacement through their helpful customer service. 300 dollars for the physical version, or this for free. Your choice. And this is very much the case when it comes to manuals. For a complete set, a manual is required. A manual is also often extremely expensive. But for every relatively recent set, you can simply search lego.com for PDF scans of the instructions (look at the bottom of the site for Building Instructions). Having the manual on your phone or computer is not quite as good as the real thing, but much cheaper. After some patient searching, or maybe a flurry of orders that add up to ghastly numbers, the packages start trickling in. It’s Christmas every other day as another parcel drops in. You check off the parts from your order (sometimes there’s a piece missing but I’ve never had problems getting those replaced). Then, one day, you have the entire set and can start building. Honestly, if you look at the time spent doing this, it might be easier to just grab the complete set and sell a kidney. But I find the progress of hunting for parts exciting in itself, and while I have spent more than I wanted on many sets, I’ve also spent much less than what the complete set would cost me. Also, while the resale value of a pieced together set is lower (mostly because of no manual or box but also because of any substitutes), it can generally be sold for the total cost (minus shipping) that you paid for it, since that’s the value of the parts themselves. And once your shelves start filling up with cool looking, rare sets that went out of print years ago, you might find that it was worth it. Det här inlägget postades i International, Prylar, Rekommenderat och har märkts med etiketterna Lego, Lego Modular Buildings, Star Wars. Bokmärk permalänken. worked well. Just ordered the Green Grocer. Came to more or less the value of a build version for sale on the internet (i.e. around 7000 sek). In any case, still ca. 25% cheaper than buying a new / in the box version which sells for anything around 10 000 sek. Maybe a bit less text in your instructions or a summary with the key steps would help though to really quickly understand how Bricklink works. In any case, still the best instructions available from what I have seen! Okay, thanks Mikael. So, should I check beforehand which parts that are on my wantedlist are rare and check if there are big sellers that have them? If there are parts that are available at just 20 sellers or so, it’s very unlikely that you’ll make an order from one of those with the regular method since they’re often small sellers (if the big sellers had the rare parts, they’d be sold already). In that case, check a few of them manually. Wow, this is an INCREDIBLY useful article, thanks for that!! >It might be a good idea to do it the other way around: to find one of the sellers who has the rare part, then check whatever else they have and get that too. How do I decide when I do it this way and when the other?